Ok, it has some issues, but this chapter is certainly an improvement over the last. Wanna know what Venser and company found down the meat hole? Read on. Our heroes land in a squishy pile of meat. From the darkness an unfamiliar voice speaks out. It warns them to not move, they're surrounded, and they all need to work together to get out of there, but they will eliminate our heroes if necessary. But who would respond well to a threat like that? Venser responds that they're not going anywhere. But the voice responds, but you will come with us and you'll like it. Koth doesn't take kindly to those words, and glows red, ready for battle. 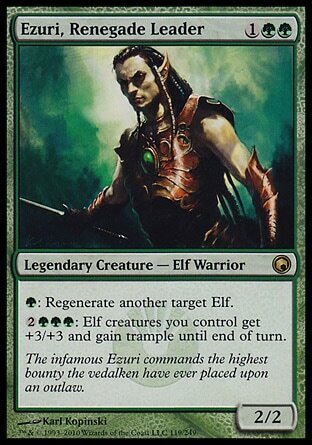 The light reveals a ragtag group of thirty elves and Vulshok, led by an elf, Ezuri . This group has been following their movements, amazed at how they always seem to go through the most dangerous paths and survive. But they need to stop. Going further in will not only get themselves killed, but will rouse the wrath of the more vicious Phyrexians that reside within, that have yet to cause havoc on the surface. This group has been battling them within these levels of Mirrodin, and claim to have them essentially contained. The planeswalkers will ruin all their work. Venser says they have to go in. They're looking for their friend Karn. (The name remains unfamiliar to all these new folk.) Ezuri still argues again, and Koth wants to argue back. In a mediator role, Elspeth asks Koth to introduce her to his fellow Vulshok. These other are unfamiliar to him. They are Shield clan, not Anvil. And the names he throws out as them are unfamiliar as well, except one, Lyser, who is confirmed dead. "Then we will suffer," Ezuri said. 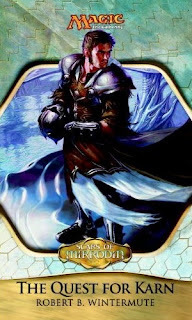 "And to be honest with you, Mirrodin's suffering has allowed me this positoin of leadership. So, let her suffer more, Mirrodin. I could not have risen as I have without the Phyrexians or the Vanishing." At least Koth is appropriately angry at those words, but they won't be swayed by anger. They believe Mirrodin will heal if it is cleaned within and without of all machinery. They believe the Vedalken started this by tinkering in the first place. The Phyrexians are tinkerers too. Somehow Ezuri knows Venser is a artificer, and says they have no need of such people. Venser counters that artificers don't tinker, they create. Tension is high, and Elspeth declares she will kill them all because they're thinking only of themselves and not the whole. Koth declares they may kill him, but he'll kill three quarters of them first, starting with Ezuri. Venser says, "Wait!" and actually does a fake out! The instant he gets their attention with that cry, he opens his hand and light flashes from within, startling Ezuri's men, and causing them all to flee in terror. "I will make that metal in your armor writhe like a snake and melt itself through your very flesh." The two don't do much more than try to talk him down, and eventually they give up and watch him take another dose. Koth asks what's exactly in it. Venser says, sap of a Zendikar corkscrew tree, minerals from a disintegration hollow on Dominaria, and blinkmoth extract. Koth relates stories he heard of Vedalken being obsessed with that stuff, and how he would never touch the stuff. New people. Good. I was afraid that maybe we wouldn't see any of the resistance. That's another checkmark from the list that we've now accomplished. Despite it not making any sense that they had such a long conversation after juts barely getting away from the butchers up above. The selfish response from Ezuri felt so out of place however. And no one of his followers seemed to object! I was expecting the resistance to want more than just individual power considering how big a threat the Phyrexians are. Maybe they're getting corrupted themselves. If it was just an excuse for our heroes to continue on alone, I'll be disappointed. Okay, now it's making a little bit more sense why Venser is written so stiffly. I assume it's to create contrast for when the addiction begins to take hold and he can lash out. I don't like the choice, the change doesn't have to be so in your face and it can still be effective, but at least it's making some sense. Ezuri may not ever make sense, but I'm confident that at least this addiction of his is going to lead somewhere. Will it screw up things in the end? Possibly. Will it be something he has to overcome for the mission to succeed? Likely. We'll just have to see if I'm right. Another question is what was the mistake he made that he mentioned in Chapter 4? Taking the concoction in the first place? Is this just a "don't do drugs" message? Or maybe he's addicted for a reason and it actually is curing something or holding something at bay. I made a list of things that I think should be happening, but so far we've covered the easy ones. We've seen a Praetor, and we've seen some of the resistance. The question is when does Thrun and Melira come in. And Glissa too. We're heading deeper into the Mirrodin and don't seem to heading to the Tangle any time soon.